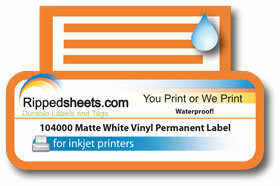 Rippedsheets.com exclusive 104000 has special chemistry that turns all inkjet inks into waterproof inks in one pass through the printer. Once you print on the material, the label can be put under water and rubbed gently without smearing. Can be used in short term damp conditions ( not dishwasher safe ). The clear acrylic adhesive is permanent on many surfaces. It has a minimum application temperature of +25°F and a service temperature range of -65°F to +200°F. 104000 can be used with our 100300 doming material (Other doming materials will not work). To obtain a high degree of water resistance, use only pigmented inks. Typical dye-based inks yield good color, but with repeated exposure to water and UV rays fading and bleeding will occur. Let image dry 24 hours before exposing to moisture. Dirt and stains cannot be cleaned from the surface without damaging the image. Excessive folding or creasing can damage the imaged surface. Laminating is recommended to protect the surface from dirt and abrasion. Note The above are typical technical values and are given in good faith based upon our most up to date knowledge and experience. As the products are used outside our control we cannot take responsibility for any damage that may be caused using the product. In every case, user shall determine before using any product in full-scale production, or in any way, whether such product is suitable for user's intended use for their particular purpose under their own operating conditions.